The goal of my residency was to create a number of pieces related to the human figure. I worked with this idea about fifteen years ago, and find myself returning to the forms with new interest. 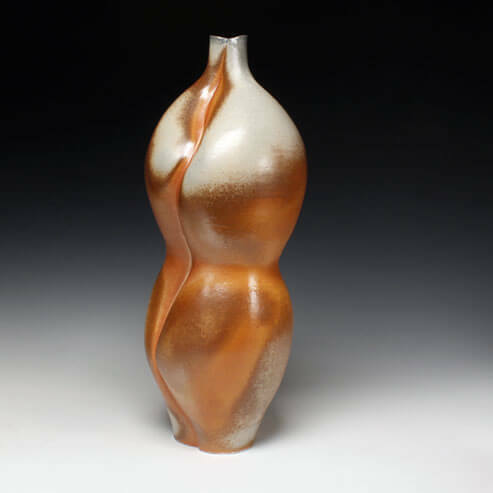 Currently I am using translucent porcelain to create female figures which show the evidence of aging. The techniques I used produced delicate wares which warped and sometimes cracked in the firing. I plan to base these translucent works so that they may be lit from the inside, revealing their translucency and fragility. These forms are contrasted with more voluptuous, vigorous forms suggesting the promise of youth. I once again found myself drawn to the plants surrounding the studio. I selected leaves to impress on some forms as a connection with the natural world. The concepts I am exploring include contrasts in fragility and beauty; robustness and fertility. I experimented with two firing methods for these forms, electric oxidation and soda reduction. The “thinware” did not hold up well in high-fired soda kiln and seems more suited to mid-range electric firing. Other ideas arose during my residency work time: Scale, groups, lighting, and utility. It was a luxury to have the time and facility to let myself follow ideas in different directions. As a result of the short term residency at the Red Lodge Clay Center, I have several directions to follow for this body of work and will continue to develop it as I return to a more limited studio schedule at the end of my sabbatical. I wish to express my thanks to all of the Red Lodge Clay Center staff and fellow residents for their helpfulness and cooperation. They made these two months in Montana truly fulfilling. Of course, special thanks go to David Hiltner for putting it all in motion five years ago. After two short term residencies, Red Lodge is “in my blood”. I hope to return for work and fun at the edge of the Beartooth Mountains.